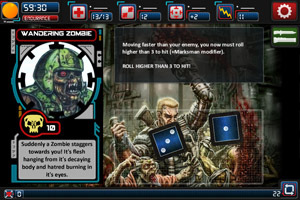 Chainsaw Warrior is a single player survival card and dice game set in a nasty zombie apocalypse. A game begins by rolling up your character stats based on the level of difficulty that you select. Next you determine your character's weapon and equipment load out based on a distributed points system. The goal of the game is to work your way through decks of cards and survive. The cards you draw can be positive or negative encounters which have instant effects or require a dice roll (sometimes modified by character stats) to resolve. You also encounter a series of gnarly beasts, zombies and mutants that you combat with die rolls modified by character stats and gear being used. If and when the player makes it through the first deck, two more decks await that must also be conquered. On top of all of this there is a time mechanic that limits the number of turns you have to complete your objective. The game is no walk in the park, and even on "normal" difficulty level it can be quite a challenge. Your success or demise hinges upon utilizing weapons and equipment tactically, as well as some luck with card draws and dice rolls. Chainsaw Warrior is a child of the 80's and this shines through in glorious artwork reminiscent of the pen and paper rpg's of the era. The app version does a nice job of adapting the classic board game to the digital domain and should appeal to fans of the original and to those who enjoy a challenging solitaire old school pen and paper gaming experience. » Duel Generation - Decks to build without premium - Suggestions ?